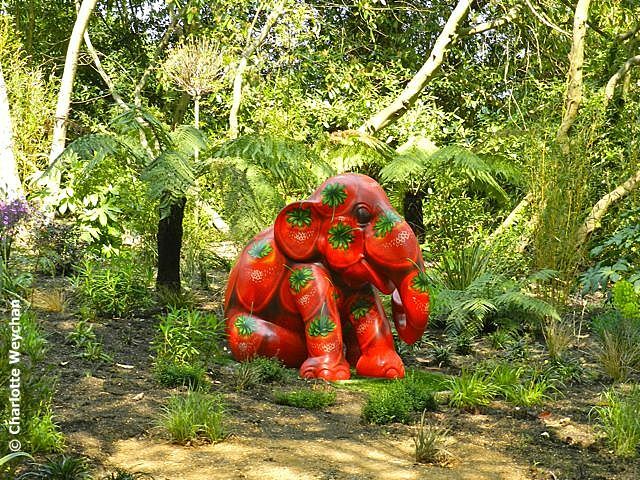 A red elephant in Woolbeding Garden ... here's the proof! We've all heard of white elephants, but when I encountered a red elephant in the middle of the water gardens at Woolbeding, I was just a little surprised! Nobody could tell me what it's doing there and internet searches have thrown no light on the subject either. So I have to assume that this is just another part of the fantasy world synonymous with the gardens surrounding the Grade I mansion that I reviewed last week. Referred to only as "Edyth the Elephant" in the temporary brochure produced by the National Trust for the opening of Woolbeding, I am unable to tell you any more! I've never posted twice on a single property before, but Woolbeding in West Sussex has only just opened and there are two very different gardens here. The formal gardens surrounding the house featured in my last post are accessible to wheelchair users, but the Water Gardens located across a grassy meadow are not. They represent a complete change in tempo; are incredibly theatrical; and leave you feeling somewhat confused! 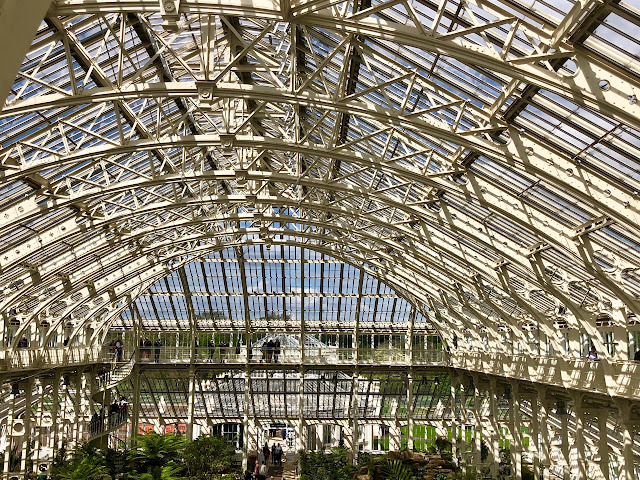 You enter the gardens beside a ruined abbey, which was transported from Scotland and reconstructed stone by stone; the arched window gives you your first view onto the water gardens below; and you then walk down a wooded valley to arrive at the water's edge. 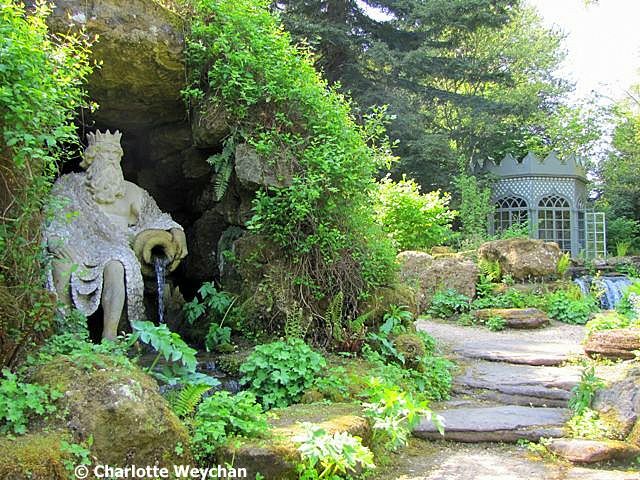 In his book, "A Garden in Sussex", written by Stewart Grimshaw, who has lived at Woolbeding for the last 40 years, he says, this "is a pleasure ground with ... hermit's hut, Chinese bridge, rustic walk, grotto with river god, Gothic summerhouse, waterfall, rills, stumpery and bubbling source ... ". The garden has all those features, but is completely different to the formal gardens surrounding the house. 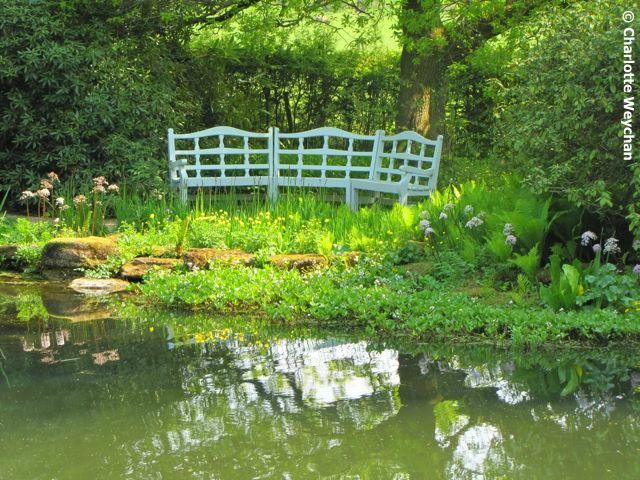 Strategically placed benches (above), painted in NT colours, overlook the water; the planting is naturalistic; it's peaceful and you half expect to encounter a troll in the undergrowth as you approach the Chinese bridge, asking you for a magic password to allow you to cross. 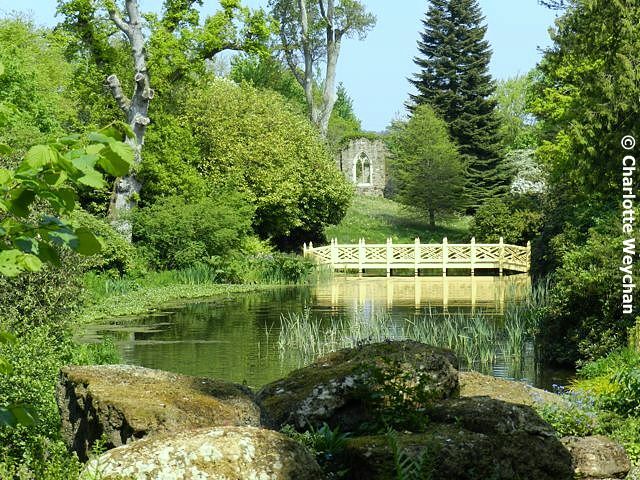 Julian and Isabel Bannerman were involved in the design of these lower gardens. Perhaps as time evolves, more will be published about Woolbeding and all will be revealed. I have attempted to get a copy of Stewart Grimshaw's book, but it's out of print and unavailable at any of the local libraries, so if any readers can tell me more, please do. Do remember that you can only access this property by car if you are registered Disabled (please see previous post for details). All other visitors must phone ahead and book. So booking from North America would be very difficult? Would you say so? No more difficult than here! But I'm sure that when this garden settles down, booking will become easier. The real issue is the single-track roads that lead to the property! Suggest that if you're planning a visit, you check the NT website for Woodbeding and see what is recommended. What a beautiful surprise the elephant is as you tour the garden. Such a beautiful garden it is too. The hut is such a nice touch. 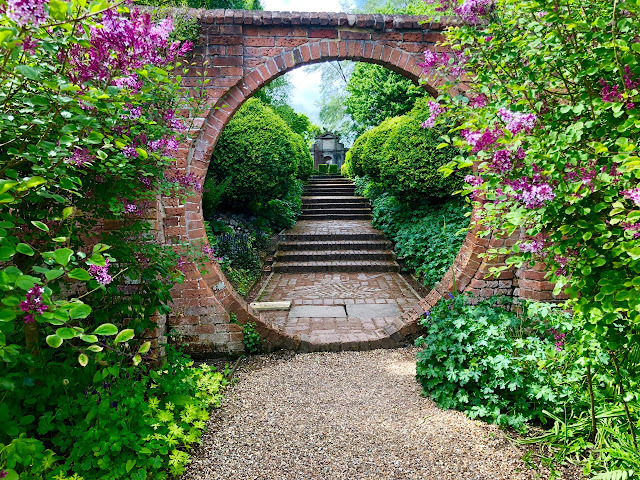 Great garden, and I only live just across the border in Hampshire, so I may well have to check this one out onmy next free weekend! Thanks for introducing me. Great garden. The elephant looks like one auctioned in the London Elephant parade last year. I love the whimsical touch to this garden. 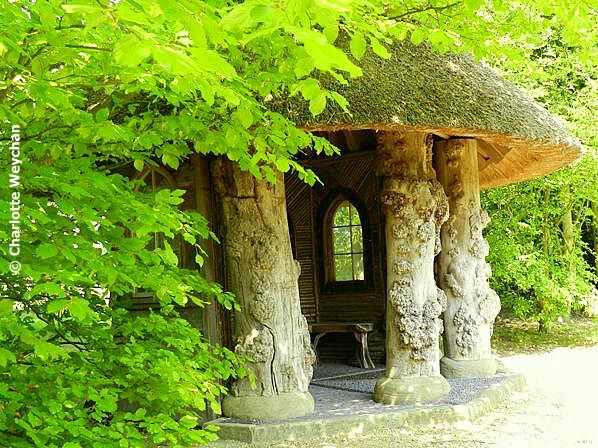 It is something similar to gardens of olde when statues and grottos and all things mystical were part of the large gardens of the wealthy. Edythe is superb as is the Hermit's Hut.